Moose will wear number 11. It seems that Mike Moustakas was holding up the Manny Machado market. Within hours of the Brewers announcing Moustakas’ official signing, Machado signed a very lucrative contract with the San Diego Padres. Kidding aside, the Moose is officially loose for the Brew Crew heading into the 2019 season. He will add his left-handed power to an already formidable line up. Most enticing for David Stearns and Co. he will do it for just one year and $10 million with a mutual option for 2020. More specifically, the Brewers will pay him $7 million in 2019 with an $11 million mutual option or a $3 million buyout. To clear a spot for Moustakas on a full 40-man roster, the Brewers shifted Brent Suter to the 60-day DL. As half the Twitter-verse has done, let me correct Mr. McCalvy, Suter was shifted to the 60-day IL - or injured list. We don’t make mistakes like that at BCB (wink wink). Obviously, Moose takes that spot on the 40 man, and it looks like he will play, or at least attempt to play second base for the Brewers. Moustakas on playing 2B: "It’s going to be fun. Obviously it’s going to be new. I’ve been over there a couple times in the shift, so it’s kind of comfortable at this point now. It’ll be fun. We’ve got a lot of spring to work on it and get better." 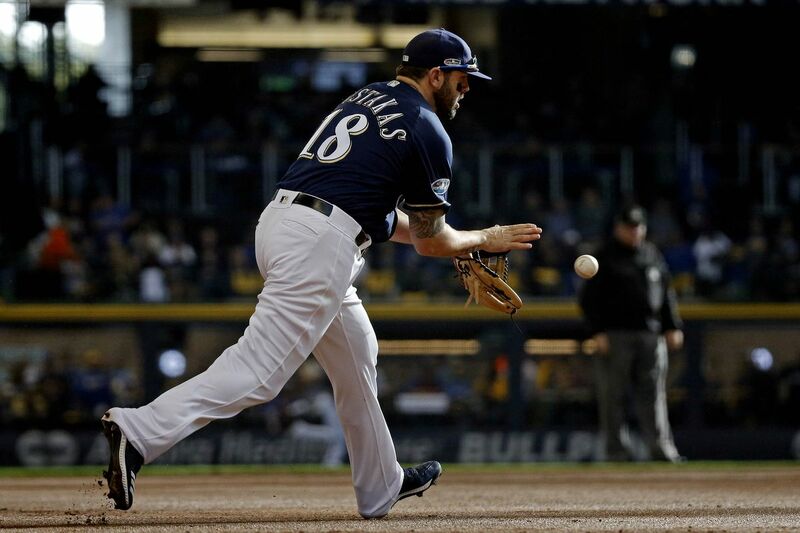 An interesting thing Craig Counsell just pointed out: The move to 2B asked of Shaw last year and Moustakas this year was a tougher ask in a different era. Not just shifts, but the Chase Utley rule makes it easier today. Craig Counsell and the coaching staff will have six weeks to help Moose make the conversion from the hot corner to the keystone. As always, the Brewers think outside-the-box to create value for the team. Another interesting development is that Moustakas will change numbers in 2019. It would appear as though Mike Moustakas will be wearing uniform No. 11 this season. According to Adam McCalvy, Moustakas will wear number 11 because it is his mother’s favorite number and he wore it growing up. As a Kansas City Royal, he wore number 8. Obviously Ryan Braun had 8 claimed. As for 11, Darnell Coles wore that number in 2018. With the official signing of Mike Moustakas and his likely move to second base, the Brewers lock in the most powerful option for the position available at any point in this free agency period. The Brewers envision his left-handed bat playing well at Miller Park, and they know his presence will play well in the clubhouse. Also with only one year invested, he does not block Keston Hiura. The Brewers waited out this market with that in mind. As a result a World Series champion landed in their lap. Now it just remains to be seen if it will work out. Brewers offense shut down by Dodgers in 3-1 loss Brewers manage just one run and five hits against the Dodgers. Milwaukee Brewers Daily Prospect Report: Thursday, April 18 Scores and notes from the Brewers’ minor league affiliates.